Offered by us is a wide and exclusive range of HDPE Vegetable Leno Bag. These bags are demanded widely in various industries and are manufactured using premium quality raw material which is obtained from authentic vendors of the industry. Our professionals make use of the latest amenities which are required in offering an absolutely defect-free range of products to our clients. Established in the year 2011, we, “Parth Plastpack Pvt. Ltd.”, are a trusted firm engaged in manufacturing, exporting and supplying a comprehensive range of PP Leno Bag, Woven Sack, Woven Fabric ,PP Fabric and Plastic Stitching Thread . Our brand product is Tiger Leno Bags.Products included in this range are Vegetable Leno Bag, Vegetable Bag, Polypropylene Woven Sack, HDPE Woven Sack, PP Woven Sack, Colored Woven Fabric, Designer Woven Fabric and others. We manufacture these products by procuring supreme quality polyethylene which is obtained from some of the reliable and certified sources of the industry. In addition to this, we employ hi-tech machines and equipment in designing these products, in absolute compliance with highest standards. Our offered range of products is widely appreciated for its high strength, durability, reliability, excellent performance, superior finish, colorfastness and eco-friendly features. 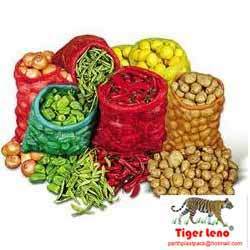 We are one of the largest Leno Bag manufacturer in Madhya Pradesh.